Today over 90 video resources were added to the open educational resources collection from Kurzgesagt.org. Kurzgesagt – German for “In a nutshell“ is a Munich-based YouTube channel and design studio with a unique perspective on design, color and storytelling. They want their work to raise awareness for topics from the fields of science, space, technology, biology, history and philosophy. Their goal is to inspire people to learn – and believe humor and a good story to tell are just as important as straight facts. The NCCCS courses that could be enhanced by using these resources are: ANT-220 Cultural Anthropology, AST-111 Descriptive Astronomy, BAF-110 Principles of Banking, BIO-090 Foundations of Biology, BIO-145 Ecology, BIO-250 Genetics, ENV-110 Environmental Science, ENV-255 Envir/Public Hth.Pathogen, GRO-120 Gerontology, PHI-215 Philosophical Issues, PHS-130 Earth Science, PHY-110 Conceptual Physics, and SAB-110 Substance Abuse Overview. Accessibility Statement: All of the videos and/or learning objects in this series are closed captioned or have links to the text version of the video narration on of each activity. Log into the NCLOR and click on “Browse by Resource Series” and then the Kurzgesagt – In a nutshell series. Simply, click Kurzgesagt – In a nutshell to view the series as a guest. As part of a National Endowment for the Humanities grant, the Arts, Humanities, and Social Sciences Division at Wake Technical Community College has developed and implemented a project, “America’s Wars: Individual Experience and Cultural Memory.” These resources have been made available in the open educational resources collection within the NCLOR. The goal of this project is to render more visible the experiences of military veterans and their families by incorporating their perspectives into humanities courses. Additionally, the America’s Wars project aims to help WTCC veterans make the difficult transition from military to college. This project also strives to present an accurate depiction of the nature of war and what soldiers endure physically and psychologically in order to foster both a better understanding of veterans and to educate students who may be considering military service or transitioning from it. By incorporating war-related materials into English, history, psychology, and philosophy courses, this project promotes cultural awareness and sensitivity to the experiences of others and enhances students’ critical thinking by helping them understand the importance of questioning prevailing beliefs and master narratives. Since these resources are open, you can access the series via Guest Access here:NEH Wake Tech CC Grant . Also you may log into the NCLOR and click on the More button on the left menu bar. Then click the Resource Series link and click the series of your choice. On May 5th, the CrashCourse educational video series was added to the open educational resources collection within the NCLOR. CrashCourse is a YouTube based educational channel that creates free, high-quality educational videos used by teachers and learners of all kinds. CrashCourse is a educational video series created by John and Hank Green. Over 660 resources were added in the courses of World Mythology, Computer Science, Sociology, Media Literacy, Statistics, Film, History, Biology, Ecology, Chemistry, Psychology, Anatomy & Physiology, Physics, Philosophy, Astronomy, and U.S. Government and Politics. This series has helped changed attitudes towards education by creating a community of learners who are looking for more than just help passing a test. Each course includes animated videos to explain course topics in an easy to understand manner. The NCCCS courses that these resources may supplement are; AST111, AST151, AST152, BIO090, BIO145, BIO163, BIO165, BIO166, CHM082, CHM090, CHM092, CSC120, CSC130, FVP111, FVP112, FVP212, FVP213, FVP3100, HEA3002, HIS111, HIS112, MAT152, PHI210, PHI215, PHY110, PHY151, POL120, PSY150, SOC100, and SOC210. Since these resources are open, you can access the series via Guest Access here: CrashCourse or log into the NCLOR and click on the More button on the left menu bar. Then click the Browse by Open Educational Resource Series link and then click the CrashCourse link. 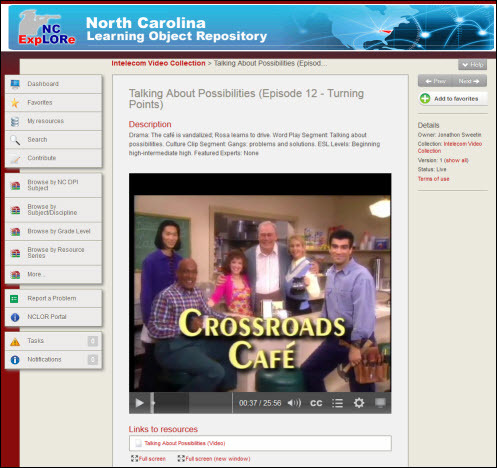 Today, three new subject areas from the INTELECOM video collection have been added to the NCLOR. The subject areas added include Adult Education, Allied Health and Philosophy. Over 780 new videos and video clips have been included in this addition. The new content includes nationally recognized documentary series such as: Crossroads Café, Madison Heights, Lifelines, On Common Ground, The Human Condition, and The Examined Life. All videos content included in this content are closed captioned and are available for viewing at the resource summary page and the attachment level for easy inclusion into LMS based courses. This purchased content has been made available only to the NCCCS system. For more information on this new content, see the detailed information below. This English language learner (ELL) series blends comedy and drama to teach English to speakers of other languages. The stories feature characters whose lives intersect at Crossroad Cafe, a neighborhood restaurant, where together they experience the struggles, conflicts, joys and victories of everyday life. Each episode features “Word Play,” an animated segment demonstrating a specific language function. Culture Clips is a video series included in Crossroads Café and made up of 26 documentary-style short segments on various aspects of life in the U.S. Ten half-hour dramatic episodes. Madison Heights centers around a hypothetical middle school and focuses on one or more families struggling to overcome adversity with courage, dignity and hope. Each episode addresses a particular problem, such as illiteracy, alcoholism, and welfare. On Common Ground is anthology of stories that unfolds in a City Hall of a medium-sized city. This 15 episode series present dramatic stories which take on controversial issues, usually in situations that lack a single right answer. Each episode concludes with a relevant video of a key event from U.S. history. Individual lessons focus on such crucial issues as racial polarization, extremism and freedom of speech, individual rights versus the public good, separation of powers, and checks and balances. Lifelines is a ten-part documentary videos series for family literacy and adult education. Inspiring stories of families working together provide meaningful, and motivating learning experiences for today’s parent learner. The Human Condition takes a comprehensive view of health care, focusing on nine topic areas: The Fabric of Health, Who is at Risk?, The life Cycle, Emotional and Mental Health, Sexual Health, Health and Chemical Substances, Health Risks: The Role of Heredity and Lifestyle, Promoting Well-Being Through Fitness and Nutrition, and The Individual in the Health/Medical Marketplace. These 26 video episodes (349 clips) combine interviews with leading health professionals, dynamic location footage, and illustrative case studies, to bring each lesson to life. The series “The Examined Life” offers learners an in-depth analysis of the wisdom of the Western world, The Examined Life studies the “Great Questions” that have intrigued philosophers from antiquity to the present. Using writings of past philosophers and interviews with more than 50 contemporary thinkers, the course episodes underscore how these great questions – What is art? Does God exist? What is the meaning of life? Does the end justify the means? – still reverberate in society today. The series includes 26 episodes (136 clips) and 15 interviews with leading contemporary thinkers (201 clips). On the quick search bar, click the search button, then select Intelecom Video Collection from the “within” dropdown list. The INTELECOM Online Resources Network is a hosted and supported digital repository and subscription database of academic video clips – streamed on demand – for use in support of online, hybrid and face-to-face classes. The NCLOR staff has recently added 17 free videos representing a sample of the INTELECOM content collection. The subjects included in this series are: Adult Basic Education, Anatomy & Physiology, Biological Sciences, Business, Environmental Studies, Health, History, Mathematics, Nursing, Oceanography, Philosophy, Political Science, Psychology, and Sociology. The suggested NCCCS courses these resources may benefit are: BTC270, BIO150, BIO250, MSC160, PHS130,EVN110, EDT110, CHM081, CHM082, CHM090, CHM092, SGD3200, CET242,SOC210, POL220, PHI210, PHI215, NUR133, HRD3001, HRD3004, DMA040, DMA070, HEA110, ECO101,HIS131, HIS237 EGY2002, ENV214, WAT150, WAT110, BUS153, and BUS110. Log into the NCLOR and click on “Browse by Resource Series” and then the Intelecom series. Simply, click Intelecom Resource Series to view the series as a guest. The Washington State Board for Community and Technical Colleges (SBCTC) has updated the Open Course Library, which is a collection of expertly developed educational materials for 81 of the state’s highest-enrolled college courses. The materials are freely available online under an open license for use by the state’s 34 public community and technical colleges, four-year colleges and universities, and anyone else worldwide. The subjects included in this update are: Business, Communications, English, Fine Arts, Humanities, Mathematics, and Science. This resource series contains the IMS Common Cartridge files of the Open Course Library catalog. These files are compatible with many learning management systems (LMS) and contain all of the course content including syllabi, course activities, readings, and assessments. Some courses have content available via Google Docs which enables users to download the course resources directly to their Google account. American Government, American Literature I, American Sign Language I, American Sign Language II, American Sign Language III, Art Appreciation, Biology I, Biology II, Biology III, Business Calculus, Business Law, Calculus I, Calculus II, Calculus III, College Success Course, Cultural Anthropology, Elementary Algebra, Engineering Physics I, English Composition I, English Composition II, French I, French II, French III, General Biology with Lab, General Chemistry with Lab I, General Chemistry with Lab II, General Chemistry with Lab III, General Psychology, Health for Adult Living, Human Anatomy and Physiology 1&2, Intermediate Algebra, Interpersonal Communication, Intro to Communication, Intro to Drama, Intro to Humanities, Intro to Mass Media, Intro to Political Science, Intro to Sociology, Introduction To Astronomy, Introduction To Business, Introduction to Chemistry (Inorganic), Introduction To Literature I, Introduction To Logic, Introduction To Oceanography, Introduction To Philosophy, Introduction to Physical Geology, Introduction to Statistics, Lifespan Psychology, Macroeconomics, Math in Society, Microbiology, Microeconomics, Music Appreciation, Nutrition, Pacific NW History, Physical Anthropology, Physics: Non Science Majors, Precalculus I, Precalculus II, Pre-College English, Principles of Accounting I, Principles of Accounting II, Principles of Accounting III, Public Speaking, Research for the 21st Century, Small Group Communication, Social Problems, Spanish I, Spanish II, Spanish III, Survey of Anthropology, Survey of Biology, Survey of Environmental Science, Symbolic Logic, Technical Writing, US History I, US History II, US History III, Western Civilization, Women in US History, and World Civilizations I. This content is licensed under the Creative Commons Attribution 3.0 Unported License which means that you are free to reuse the course in its entirety, edit it and use a your own modified version, or pick out only pieces which can be incorporated into your own course, as long as you credit the original author for their work. ACC111, ACC115, ACC118, ACC119, ACC120, ACC221, ACC3107, ANT210, ANT220, ANT230, ART111, ASL111, ASL112, ASL211, ASL221, ASL222, AST151, BIO100, BIO106, BIO110, BIO111, BIO112, BIO155, BIO160, BIO163, BUS110, BUS115, BUS116, BUS121, CHM115A, CHM121A, CHM131, CHM131A, CHM151, COM110, COM120, COM150, COM160, COM231, COM3709, ECO251, ECO252, EGR150, EGR220, ENG090, ENG110, ENG111, ENG116, ENG131, ENG132, ENG138, ENG231, ENV110, FLI3714, FLI3717, FRE111, FRE112, FRE211, FRE212, FRE221, GEL120, HEA110, HIS111, HIS121, HIS122, HIS131, HIS132, HIS162, HIS165, HIS232, HUM211, LIB210, MAT070, MAT080, MAT101, MAT151, MAT171, MAT172, MAT210, MAT223, MAT271, MAT272, MAT273, MSC160, MUS110, PHI210, PHI216, PHI230, PHY080, PHY090, POL110, POL120, PSY110, PSY150, SOC210, SOC220, SPA110, SPA111, SPA211, SPA212, SPA241,and SPA242. Log into the NCLOR and click on “Browse by Resource Series” and then the Open Course Library series. Simply, click here to view the series as a guest. Today, fifty new courses from the Notre Dame University OpenCourseWare were added to the NCLOR. The Notre Dame OpenCourseWare (OCW) is a free and open digital publication of course materials. By offering free, high-quality course materials to the world, OCW strives to overcome the barriers geography, economics, age and language present to the spread of knowledge. 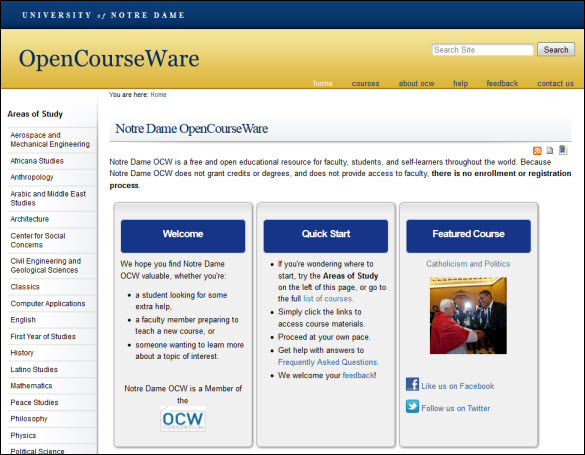 This is a screenshot of the Notre Dame University OpenCourseWare website at http://ocw.nd.edu/. The courses included in this resource series have links to lessons, assignments, exams, and additional resources. There are IMS package links in every course in order to download the complete course at one time. The subjects included are: Aerospace and Mechanical Engineering, Africana Studies, Anthropology, Arabic and Middle East Studies, Architecture, Center for Social Concerns, Civil Engineering and Geological Sciences, Classics, Computer Applications, English, History, Latino Studies, Mathematics, Peace Studies, Philosophy, Physics, Political Science, Poverty Studies, Sociology, Theology, and University Writing Program. click on the Notre Dame University OpenCourseWare series. The Washington State Board for Community and Technical Colleges (SBCTC) has created the Open Course Library, which is a collection of expertly developed educational materials for 42 of the state’s highest-enrolled college courses. The materials cost $30 or less per student and are freely available online under an open license for use by the state’s 34 public community and technical colleges, four-year colleges and universities, and anyone else worldwide. The subjects included in this resource series are: Business, Communications, English, Fine Arts, Humanities, Mathematics, and Science. This resource series contains the IMS Common Cartridge files of the Open Course Library catalog. These files are compatible with many learning management systems (LMS) and contain all of the course content including syllabi, course activities, readings, and assessments. This content is licensed under the Creative Commons Attribution License which means that you are free to reuse the course in its entirety, edit it and use a your own modified version, or pick out only pieces which can be incorporated into your own course, as long as you credit the original author for their work. The NCCCS courses that could be enhanced by using these resources are: ACC119 ,ACC120 , ACC3107 ,ACC111 ,ACC115 ,ACC118 , ANT220 , ANT230 , ART111 ,BIO106 ,BIO163 ,BIO111.BUS110 ,CHM131 ,CHM151 ,COM231 ,ECO251 ,ECO252 ,EGR150 ,EGR220 ,ENG110 ,ENG090 ,ENG111 ,ENG116 ,ENG131 ,ENG138 ,GEL120 ,HIS131 ,HIS132 ,HIS232 ,HIS165 ,LIB210 ,MAT080 ,MAT070 ,MAT151 ,MAT171 ,MAT172 ,MAT271 ,MAT272 ,MAT273 ,MSC160 ,MUS110 ,PHI210 ,PHI216 ,PHI230 ,PSY110 ,and PSY150. Today, 58 eTextbooks from Flat World Knowledge were added to the NCLOR. Flat World Knowledge (FWK) is a college textbook publishing company with a mission to use technology and innovative business models to lower costs, increase access and personalize learning worldwide. They work with successful textbook authors and well-known scholars to create great free textbooks. 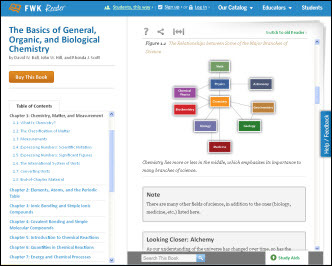 This open textbook model gives faculty complete control over their content. Students have a choice of low-cost print and digital formats, including a free online reader. With the FWK online reader you can search or jump to any part of the book using the table of contents. Click on any chapter title or section and head directly there. Subjects included in this resource series are: Business & Economics, Science, Humanities & Social Sciences, Professional & Applied Sciences, and Mathematics. Log into the NCLOR and click on “Browse by Resource Series” and then the Flat World Knowledge series. The Yale Open Courses Resource Series was updated today with 17 new courses. Open Yale Courses provide free and open access to a selection of introductory courses taught by distinguished teachers and scholars at Yale University. The new course resources include all video lectures and course syllabi for the year the courses were offered at the institution. The list of the Yale courses along with the recommended NCCCS course the resource may enhance are outlined in the chart below. Log into the NCLOR and click on “Browse by Resource Series” and then the Open Yale Courses series.